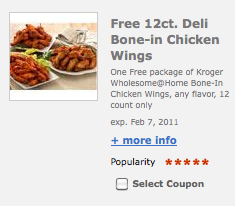 Load an ecoupon good for a FREE 12-ct. Deli Bone-In Chicken Wings at Kroger to your Kroger Plus card! Just click on “Special Offer” on the right-hand side. 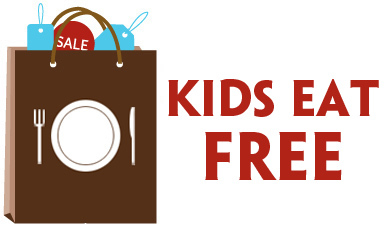 The coupon expires 2/7, so use it this week when you’re doing your Mega Event shopping! 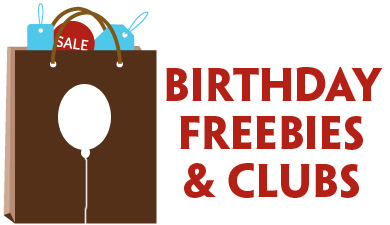 Previous Post: « Orange Julius: FREE Drink for Your Birthday! Is the chicken coupon still available? If help, could you explain how to find it. How long was it available? 5 minutes? I got mine early this morning. Going, going, gone! Didn’t get one either :( WOW that must have went fast! I’ve had many problems with kroger card coupons. I did not try this e-coupon, but have started having problems with their e-coupons. Finally got a number at corporate who takes care of these things.My problem was it downloaded to my card but would not give me credit off my bill. The number just for this problem is 1-888-553-3003. You will have to have the receipt of when you bought the product, the UPC code off the product . . .yeap that’s right, your kroger card number. It seemed very tedious since I had to go to the freezer and dig out the product for the UPC code (under the bar code). She said she would credit my card (it came through) but only once and if I continued to have problems with that product, the attitude was “tough;” Only one credit. I got it early yesterday morning, and successfully used it last night. Where did you find the chicken that worked with the coupon? I’ve heard different reports that it’s either pre-packaged or from the deli counter. Dora where did you find the chicken? We went to the deli and and did not see this product. Would love to be able to use the coupon. i can’t get to the coupon for the chicken wings. how?